The status of the company is determined by the office, which directly impresses partners and customers. High-quality repair and fit-out Dubai creates a prestigious image of the company, which demonstrates the solid intentions of the company and its success. Interior design and construction company Luxury Antonovich Design offers services for office interior fit-out and renovation of any complexity. Our company uses a rational and practical approach to the organization of office space, which is an important aspect in the office fit-out. First of all, the technical condition of the premises is assessed and the type of repair and fit-out works is selected. Thanks to the technical evaluation, the opportunity to assess the time and financial costs, determine the type of building materials. Designers of Luxury Antonovich Design carefully prepare a design project that meets the requirements of the customer, is visually attractive with the rational use of space. 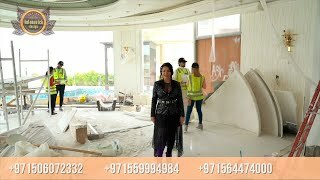 Luxurious decoration and office fit-out Dubai performed by our masters involves the use of natural stone, fine wood, glass, and porcelain stoneware in the interior. These materials in the interior fit-out give the appearance of the office respectability and solidity. — painting windows, doors, replacement windows. — selection of furniture and lighting, as well as decor items.